There are some people who are eagerly anticipating it, and some who are painfully aware of it – Sunday is Valentine’s Day. Aside from the ubiquitous red hearts, another enduring symbol of this day is chocolate. It’s very easy to go and buy some chocolate, of course, but I always think that handmade things convey a better feeling of sincerity. 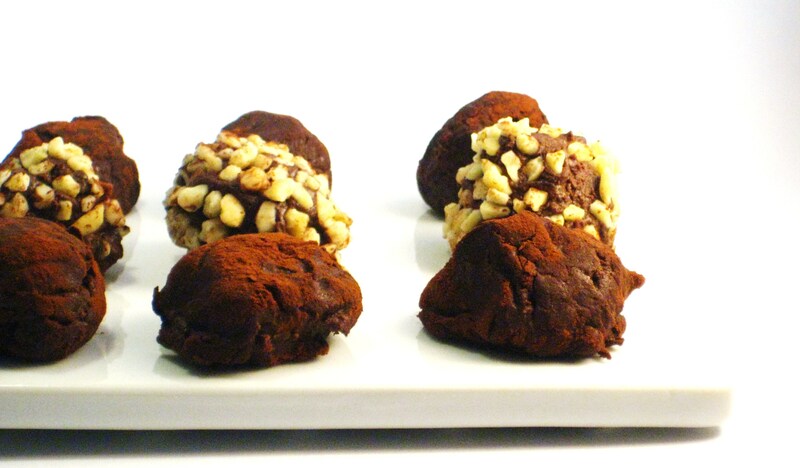 Chocolate truffles are really nothing more than firm chocolate ganache. They are very easily flavoured by the home cook – you can add espresso powder, nuts, fruit liquers, and even more exotic things – for example, tea flavours like Earl Grey, chai, and matcha. They do require a bit of time, mainly for the chopping and firming processes, though the former can be greatly expidated if you buy smaller bits of chocolate (ie. small chips or chips) instead of couverture (block) chocolate. The downside is that chocolate chips are usually not as of as high a quality as couverture. The best type of chocolate to use is 70% chocolate (bittersweet), but in principle, it should work with milk and white chocolate too. I used 0.79€ zartbitter chocolate I found at Rewe, so it doesn’t have to be expensive. 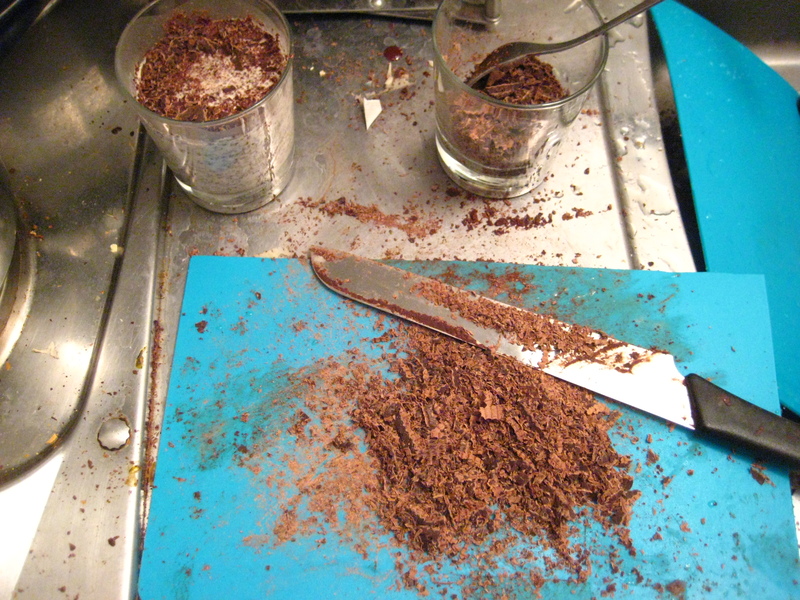 Chop chocolate and place in a glass cup or bowl. 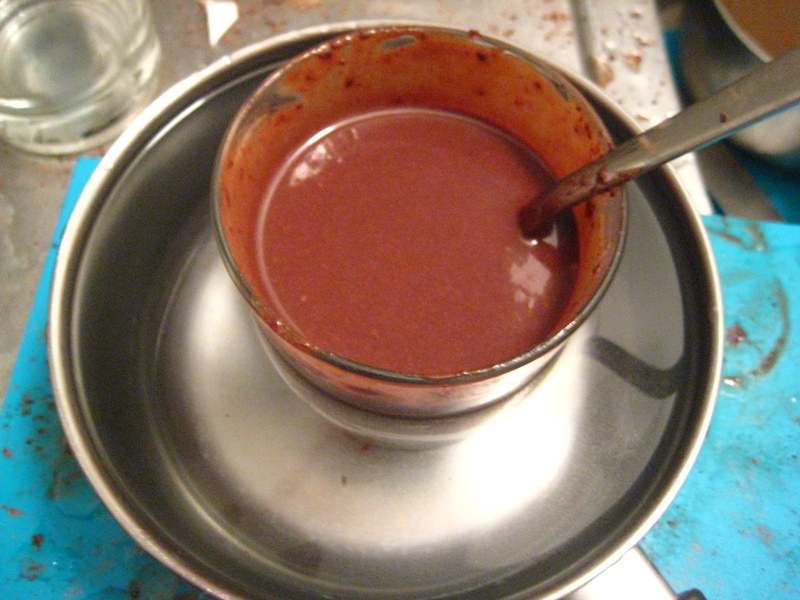 Add cream to the chocolate and place the cup in a small pot of water (water level should be up to the level of chocolate in the cup). Stir until there are no lumps left. At this point, you can add flavouring if you’d like. Remove cup/bowl from water and place in the refrigerator. Let it firm up to the consistency of semi-soft ice cream. Scoop the chocolate with a tea spoon (or a melon baller, if you have one) and form into a roughly spherical shape using another spoon. Roll the chocolate ball in cocoa powder or nuts to coat and set aside on a plate or tray (you can line it with wax paper if you want). These look gorgeous! I love Valentine’s Day because in my opinion it’s more like Chocolate Day. YUM. I agree. Whether you have a special someone or not, chocolates always seem to be in order on the 14th of February.